Against The Current Took Over Our Instagram Account Yesterday. Here’s What We Learned About Them. We gave pop-rock newcomers Against The Current the keys to our Instagram account yesterday while they set about shooting their new music video. Here's what happened. 1. Vocalist Chrissy Costanza has some incredible beard game. Chrissy from Against the Current here! Just a running through my intensive beard grooming routine for our shoot for our song Paralyzed off our upcoming Gravity EP (out feb 17th). We're going to be interrupting your scheduled programming today with updates from the set of our shoot, and beard grooming tutorials. 2. Pizza techs actually exist and Against The Current have one. Minimizing grease spills one pizza tech at a time. Who's psyched to see the video for Paralyzed?! Applications are now open for the position of resident pizza tech at Rock Sound towers. No, not really. 3. Their upcoming video for 'Paralyzed' is going to look awesome. Just look at that room. "It feels like I'm paralyzed, and I can't escape from the prison I'm living in." | Pre-order our new EP Gravity now at www.atcofficial.com! "Do we have enough lightbulbs, guys? I dont think we have enough lightbulbs..."
4. Sometimes Will Ferri needs to be reminded that he can't eat the drumsticks. In his spare time, he's employed at Sea World as a Walrus. Also, that man is far too close to the camera. Back it up, fella. 5. Guitarist Daniel Gow is unintentionally more attractive than you. I promise he didn't pose for this, he really just is this handsome. Damn him. With his youth. And his face. So that's what we learned. If you want to see more of this sort of thing, let us know on Twitter / Facebook / by email who we should next let take over our Instagram. 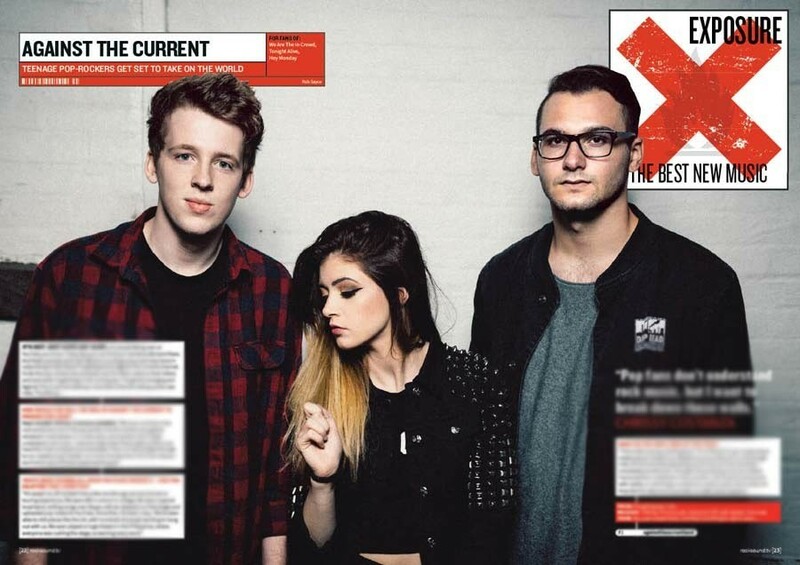 If you want to get your teeth into Against The Current some more, make sure to pick up your issue of Rock Sound 197 right now. They have a big ol' page in our Exposure section (here's a little sneak peek of what that's all about here). You can download the issue right now, order a copy straight to your door (we ship worldwide!) or you can pick it up in all good UK stores.